This is a rare, clean spiral ratchet screwdriver, in very good used condition! It is marked "MILLERS FALLS GREENFIELD MASS. MADE IN U.S.A. NO. 61A PATENTED MARCH 30, 1926" on the nickel plated area between the handle and the selector switch. It measures 17" long overall fully extended without the bit in the chuck, has a rosewood stained hardwood handle. 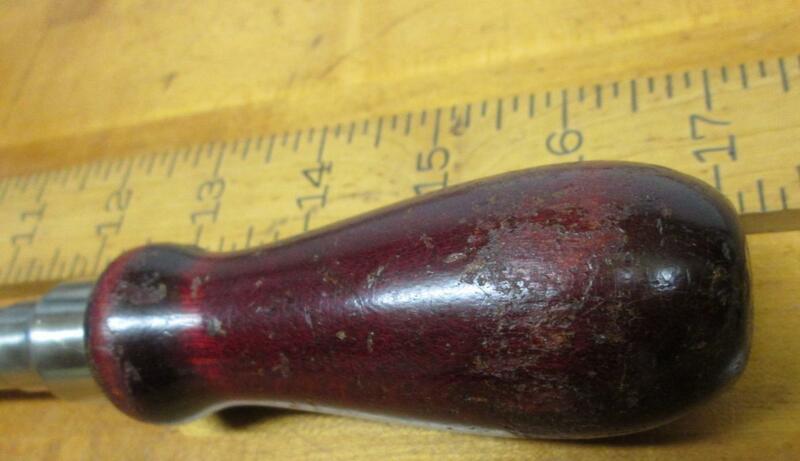 The wood handle is solid with about 90% of it's original finish intact, we note most of the missing finish is the top clear lacquer, light bench wear, as shown in the pictures. The steel screwdriver head and shaft is in very good useable condition with very little wear. Nickel plating is 99% intact. The selector on this one moves smoothly and holds position very well, three position, left, right, lock. The spiral function is not spring loaded on this one, and can be locked in the compressed position. The hex bits are removeable, and we have included the two Phillips hex bits with the Yankee adapter that fits the chuck. 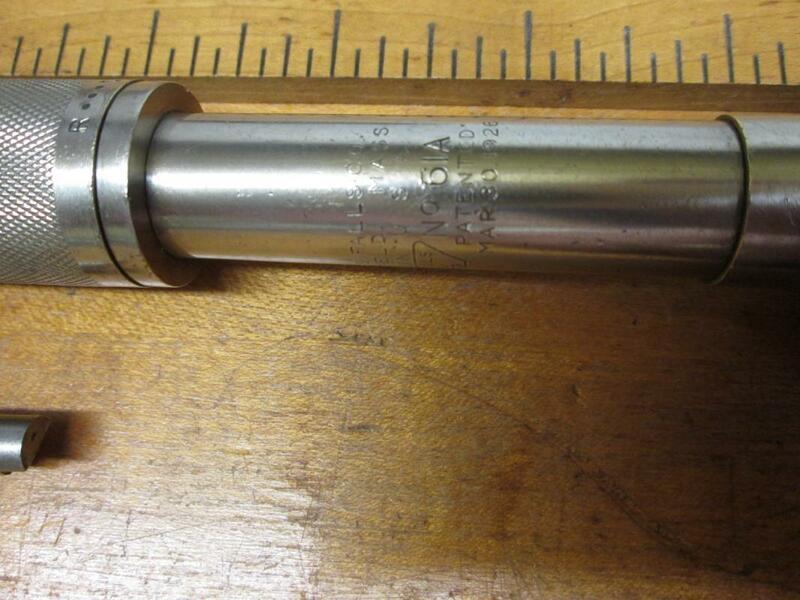 This driver requires a 9/32" or .280" diameter shank adapter to fit the chuck, and will except that size in original Yankee Phillips adapter bit (Ref. 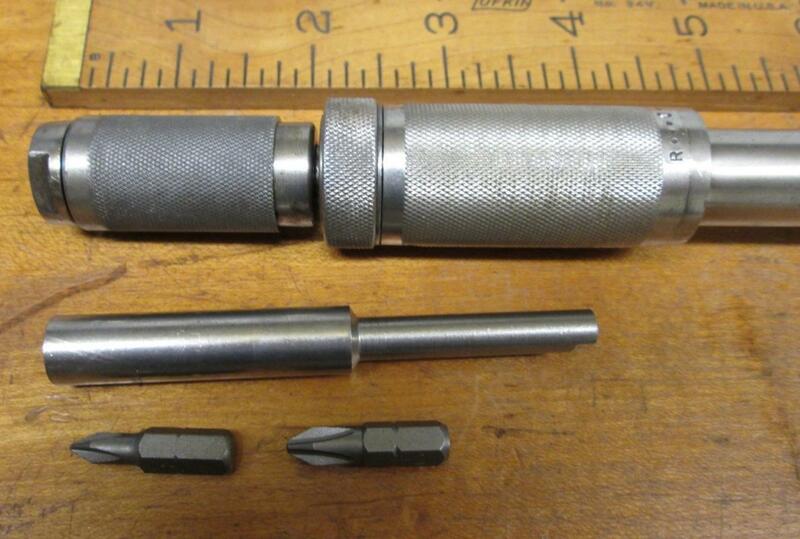 Number is T5630A), of which one is included in this purchase along with the two hex bits to fit it. The adapter and hex bits are new. The hex bits are easy to find at your local hardware store, so you can add others as needed. A very nice medium sized spiral ratcheting screwdriver! A very nice antique ratchet spiral screwdriver from the 1930's era! Items Similar To "Millers Falls Ratchet Spiral Screwdriver No. 61A w/Hex Adapter"